If you have an installed lawn irrigation system, or are thinking about getting one, a critical component for efficient and effective operation is a rain sensor. What exactly is that, you ask? A rain sensor is a device that uses electricity to turn a lawn sprinkler system on and off depending on the moisture generated by rainfall. While earlier generations of rain sensors were not very efficient, the latest generation has an improved design and technology that prevents accidental over-watering. Here’s how it works: a hygroscopic disk similar to cork expands when it gets wet. The wetter it gets, the more it expands. The expanded disk triggers the switch after a preset amount of rain has fallen. It continues to expand as more rain falls. The system will not resume scheduled cycles until the disk dries out and returns to normal size. The more rain that falls, the longer the sensor prevents watering. Wired sensors are less expensive and don’t have batteries to replace. Wireless sensors are more convenient to install and have almost no wiring to get damaged. The sensor can be installed up to three hundred feet from the receiver. Each model has its own unique mounting hardware and some are more versatile than others. Why should I install a rain sensor? The short answer is that rain sensors conserve water and your money. Much of your household’s water consumption goes directly to watering your yard. Sprinklers that automatically activate after a heavy rainfall can waste water and flood low-lying areas. Rain sensors that are triggered by adequate rainfall will send a signal to the irrigation controller to shut off any set timers. As a result, the sprinklers will not waste water on a yard that is already saturated. Some sensors will note the evaporation from their assemblies over several days to keep the sprinklers turned off until watering is truly needed. As we mentioned above, rain sensors can save you money. Water bills can be substantial, depending on where you live. Large gardens can take more water in a month than all the fixtures in your home combined. Preventing periodic watering after a rainfall with sensors enables you to cut your water bill and save that money. In addition, the longer irrigation system lifespan will also save you money because you will not need to replace irrigation system components as often. 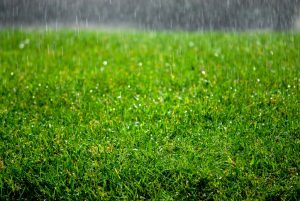 To learn more about rain sensors and lawn irrigation systems, contact the sprinkler system experts at Mike Lynch Enterprises.